Burnley's Jeff Hendrick and Barnlsey's Cameron McGeehan battle for the ball during the Emirates FA Cup, third round match at Turf Moor, Burnley. Photo: Dave Howarth/PA Wire. 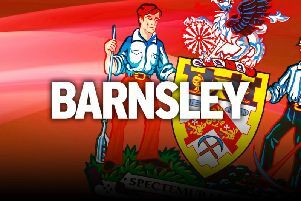 Once the hurt of the last-gasp FA Cup defeat to Burnley dies down, Barnsley will be encouraged by how the level of their performance might impact their League One promotion push. The Reds were minutes away from earning a replay against the Premier League outfit at Turf Moor until Liam Lindsay fouled Matej Vydra in injury time and Chris Wood tucked home the late penalty to secure a 1-0 win. It was hard on Daniel Stendel’s men who gave a team two divisions above them a difficult afternoon and the manner of their performance ought to stand them in good stead as they now concentrate solely on trying to winner promotion in the second half of the season. Wood’s winner was the second penalty of the day awarded to the Clarets, but the first one was overturned just as Vydra was about to take it when VAR ruled out for an offside in the build up to the offence. Stendel has been subjected to many new things in his first stint in English football, but VAR is not one of them. Burnley boss Sean Dyche was frustrated by the time it took the decision to come to pass. “Try watching the Bundesliga!” was Stendel’s response. “The first one I think is offside, but I can’t see 100 per cent from my position,” he added. “It was a good decision for us in this moment. “I know it from Germany in the Bundesliga with VAR, it is good the time between the foul and the decision was not so long, that is important for the players and the supporters. The Reds were on the wrong side of another decision in the first when Cameron McGeehan’s effort on the stroke of half-time was ruled out for offside. Both sides had chances in the second half, with Adam Davies called into action on a couple of occasions, while the Reds threatened from set-pieces, but Alex Mowatt and Cauley Woodrow could not take advantage. It looked as if the League One visitors were going to get a replay and a second chance at an upset until Wood had the late, final, say. Stendel said: “I think the performance was good, after the first 10 minutes we were good in the game, we had some chances and in the last 20 minutes.